ISTP students grow and become truly remarkable adults. They develop an unparalleled sense of drive and hard work, which can take you just about anywhere – even the White House. 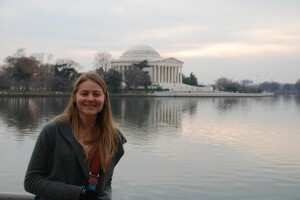 From August 2012 to January 2013, the White House was fortunate to have had not just one, but two motivated ISTP alumni in their midst. Zoe Kornberg in D.C. during her White House internship. While Matthew and Zoe worked in the same office, being on different teams meant they experienced these current events through slightly different lenses. Zoe, being on the State team, interacted with governors across the nation. Matthew, who was a member of the Local team, worked primarily with mayors from around the U.S. When asked about the projects he worked on, Matthew said there was one that really sticks outs to him – Hurricane Sandy. Matthew even commented about the benefits of knowing other languages. His Spanish language skills (which started at ISTP), came in quite handy during a phone call with the office of the Governor of Puerto Rico! We are proud that ISTP continues to play an important role in the lives ours alumni, but experiences like these can leave their own imprints. To be part of any White House team is an extraordinary opportunity, and has the potential to profoundly affect one’s career choices. 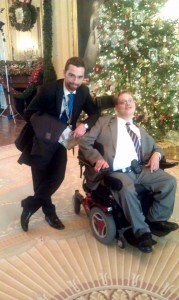 Matthew Colford with his friend and colleague Matt Shapiro from the President's Office of Disability Outreach. ISTP alumni have the ability to do brilliant things in their lives and careers. Matthew and Zoe are just two examples of that brilliance in action.